I'm beginning to think it would be impossible to not be entertained at a Colin Hay show. I've seen the former Men at Work frontman-turned-respected solo singer/songwriter a handful of times, and every time he brings a full-on performance that's nearly equal parts music and stand-up comedy. Those only casually familiar with him and the few 1980s hits of his previous band from Australia might be surprised by his body of work, his sharp sense of humor and the power of his delivery. These were all on display Saturday night at Park West as Hay gave Chicago fans another top-quality performance as part of a tour supporting his most recent record, Gathering Mercury. Following a tight, energetic opening set from Boston's Chris Trapper (whose world-weary-yet-endearing songs, humor and likable, laid-back demeanor proved a perfect match for the headliner), Hay came on stage and began with the title track from the new album. Starting a show with new material can be a risky move, but the Scotland-born, L.A.-based songwriter certainly pulled it off. The crowd watched and listened intently from the first note. Beyond his songwriting skill and distinctive, grabbing vocals, Hay just has that rare, undefinable quality that forces you to pay attention. Another new song, "Family Man," followed. Hay set it up with a lengthy story about his father (who recently passed on), explaining the impact he had on his life and how the track really belonged to him. On paper this might sound too serious and heavy-handed, but as with all of his stories, there was amusing, random humor scattered throughout. In fact, Hay's stories are almost as important to his acoustic shows as his music. They're long, but they're hilarious and they set the songs up perfectly. Hay even joked about this very subject, remembering how Paul McCartney once came to see one of his shows and apologized in advance if he had to leave early because of jet lag; he asked McCartney to stay for just two songs, noting to us: "As you know, two songs can take a very long time." As the show went on, the set focused on a few different albums and time periods from throughout his career. The biggest Men at Work hits were present in the form of "Who Can It Be Now?," "Overkill," "Down Under." Besides Gathering Mercury, two solo albums - Going Somewhere and Peaks & Valleys - got the most airtime via the likes of "Wayfaring Sons," "Maggie" and "Conversation." There was perhaps a bit too much focus on new material near the end of the set, but that was forgiven when Hay closed with superb performances of three of the strongest tracks he's ever penned: "I Just Don't Think I'll Ever Get Over You," "Beautiful World" and "Waiting for My Real Life to Begin." Over the course of all this, we heard about Hay's trippy experience playing in Ringo Starr's band, the absurdity of both the royal wedding hype and the possibility of Donald Trump running for president, and a warning of how an innocent flute part in a song can come back to bite you 30 years later (the songwriter recently faced litigation after "Down Under" was accused of stealing the melody of a traditional Aussie folk song). The entire show was a reminder of just how skilled Hay is at storytelling, in both song and speech. In addition, the man comes across as completely ego and attitude free, which is always welcome and refreshing in an art form that can all-too often seem delusional and jaded. There are plenty of musicians I've gone to see once where once was too much. 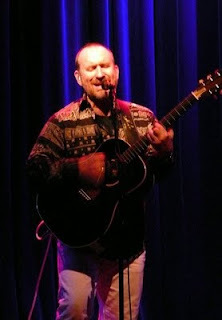 I'm beginning to lose count of how many times I've seen Colin Hay, but I'll happily continue to go to his shows and be entertained whenever he passes through town. Excellent show! As you said, Colin always brings it.